← I need a camper, H.I. I included a poll in an earlier post to find out what little luxuries people want in their campers. The wet bar won by a landslide (only five people responded, but still, it was unanimous). So that got me thinking, what cool tin can taverns have people concocted? So far I’ve discovered that the folks who own this Phuket pub-on-wheels did a smashing job. And apparently there are several of these VW bars from the beaches of Thailand to Bangkok (puts our food trucks in the U.S. to shame). So Singapore has its Sling; New Orleans is famous for her Hurricanes. And no trip to Dublin would be worth its weight in stout without a Guinness or two. 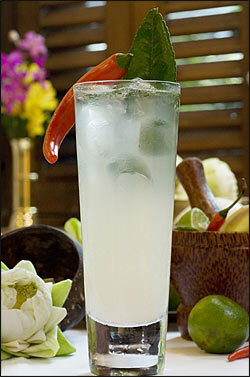 Now Thailand wants in on the signature cocktail game, too, and they’ve created a winner–the Siam Sunray. If you don’t want to fly all the way to Bangkok to sip this spicy cocktail, you can make it at home (providing you know the metric system). This entry was posted in Getting Started and tagged camper bar, VW camper. Bookmark the permalink.